We meet again for chess over the boards this Wednesday, August 29, 2018, from 5:30 p.m. - 9:00 p.m. at Starbucks, located at 1536 Kirker Pass Rd., Clayton, Calif., just a couple of driveways up from where Ygnacio Valley Rd. intersects with Clayton Rd., in the Clayton Station Shopping Center! Come by anytime, the earlier the better for the better tables, more games, and some really nice, interesting company! Last week's session saw nearly a dozen players, from seasoned players to beginners, enjoy an evening of chess. On hand for the fun were David, John B., Jonathan, Mike T., Tony T., Ann, Chris Th., Justin, Primo, Jocelyn, and Rosa . . . ! Our chess club is firming up plans for rated Quads, and may have to set up the first Quads (for 4 or 8 or 12 players) to take place on either Sunday September 16, 2018 or the following Sunday, September 23. Expect an entry fee of no more than $30; Time control: G/45 and current membership in the US Chess Federation required. Location to be announced. If at least 4 players or more would like to have rated Quads on Sunday, September 9 please let me know, and I can arrange it at a location very close to Starbucks! Yesterday's chess session at Panera Bread Restaurant saw about 9 or 10 players get together for some challenging fun over the boards, with the highlight being Priya's two consecutive, spectacular victories over a couple of higher rated players! Adding to the fun of the afternoon was Reza possibly going undefeated, and everyone meeting yet another new player by name of Justin, whose first game was with Jackie, and ended in a solid draw! Very much in the mix were Chris B., Carl, Bob, Tony, and Mike T., who once again blundered his way to a loss to Tony! ... and speaking of calendar dates, we'll have our first Quads on Sunday, September 9, 2018. The location is yet to be determined but will be near out usual Starbucks location. Figure 4 to 8 players, no more than 12 players for the first time; One day only each month; Time control Game 45 minutes a side with a 5-sec delay (G/45 d5). All games are rated games. 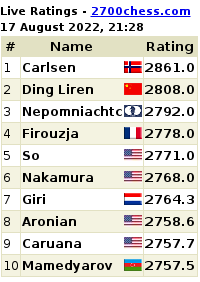 All players must be current members of the US Chess Federation. It's a great opportunity for unrated players to get started! So then, let me know if you have questions and/or want to reserve a spot on the first Quads! More details will be forthcoming, e.g., reasonable entry fees, cash prizes, starting times, etc. CHESS this Sunday Aug. 19th at Panera Bread Restaurant! Just a reminder to: Join the group for fun, challenging chess over the boards this Sunday afternoon, August 19. 2018, from 2:00 p.m. - 5:30 p.m., at Panera Bread Restaurant, located at the corner of Bancroft Rd. and Treat Blvd. in Walnut Creek! Come by anytime, the earlier the better for the better tables, more games, and some really nice, interesting company! Up ahead: Rated Quads! Two quads to kick off the first set of Rated Quads held by the Contra Costa Chess Club!! First 8 players to sign up will get it done, and for any unrated player this is an ideal way to get started! Date: Sunday, September 9, 2018! More details forthcoming! Let me know if you're interested and want to be in the first 8 !! Also: Veterans' Day Weekend (November 2018) Tournament at the Crowne Plaza! Stay tuned for more details! Chess over the boards this Wednesday evening as usual at Starbucks! Join us from 5:30 p.m. - 9:00 p.m. at the Starbucks located at 1536 Kirker Pass Rd., Clayton, Calif., this Wednesday, August 1, 2018. Come by anytime, the earlier the better for the better tables, more matches, and some really nice, interesting company! Last week's session saw about 13 players at the fun, challenging game of chess both inside and outdoors in what turned out to be a very nice evening. Four players even went to Carl's Jr. across the parking lot to continue after closing time at Starbucks! While the evening's session started slowly, sure enough more players came by, including Steven, new to the club, welcomed by Tony, Mike T., Zach, Seth, Jonathan, Priya, Chris Th., Ann, Justin, Rich, David, and John S.! We welcome players of all ages and skill levels, there are no dues, no purchase required!